I first came across Ipega brand when I reviewed E-Box T8-4 TV box which included Ipega PG-9028 Bluetooth game controller, which also serves as an handle for your smartphone, so that you can easily play game on your Android smartphone while holding the gamepad. 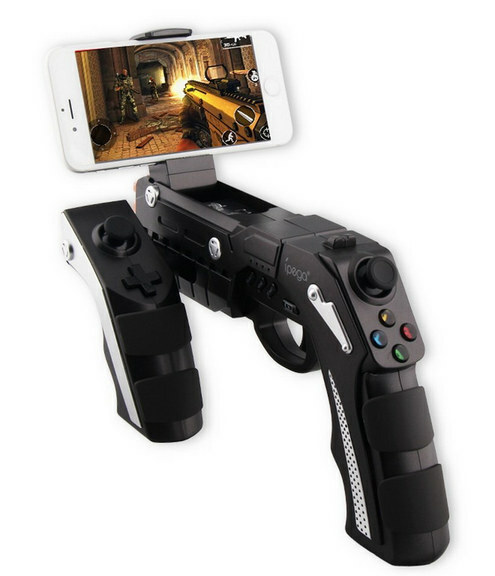 That kind of controller is now pretty common, but Ipega 9057 might be a little less common as instead of a gamepad, a gun carries your smartphone instead making it suitable for first person games such as Dead Trigger, Shadowgun, or Modern Combat. The gun is particularly interesting for Android 3.2+ smartphones and iPhones running iOS 7 or greater, but it’s a standard Bluetooth human interface device (HID) such it will also work with other Bluetooth enabled products like Android TV boxes, Windows computers, and so on. It would probably much fun if it supported motion control with the games responding to your movements, but based on the demo below you need to stay static, and press buttons as you play. The gun is sold for about $50 to $55 including shipping on various shops such as Aliexpress, Amazon US, eBay, and Banggood. You can find a few more details in the user’s manual. Oh boy…..Can’t wait to get one personally delivered to my house by my friendly postman, accompanied by a squad of armed Postal Inspectors, a full complement of US ATF agents, a platoon of FBI goons and the local SWAT team dressed in body armor and full combat regalia. No thanks, think I’ll pass.